I love, love, love October. The leaves! The slight chill in the air! The colours! I know everyone raves about Autumn or Fall, to be all American about it, but surely even the most cynical of seasonal apathists must take some pleasure in this time of year. For me, it’s the autumnal harvest that does it- some of my favourite things come to bountiful fruition over this period. Blackberries, apples, pumpkins and squash, leafy green kale, root veg, chestnuts, game. It’s all good, hearty stuff for when the nights begin to draw in and there’s lots of brilliant (and some shamefully awful) period drama on telly. 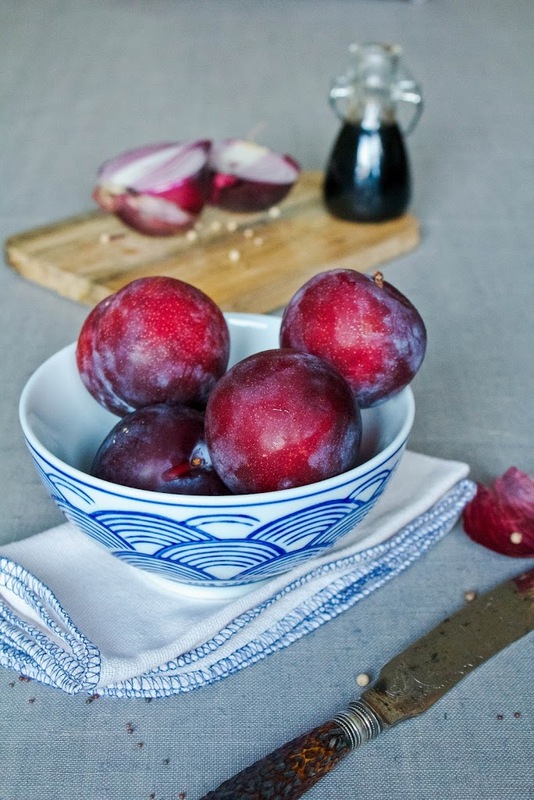 Plums take centre stage in this post- wonderfully versatile in that they can be transformed into sweet, salty or spicy treats. 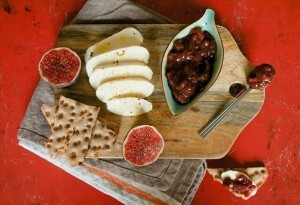 I think they are really delicious with rich meats or pungent cheeses in the form of a chutney. The European plum is in season from August until the end of this month, so get pickling now. 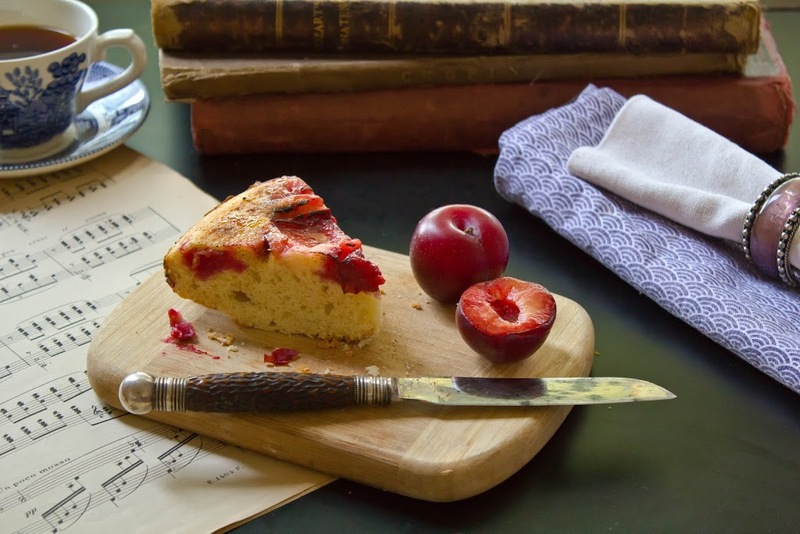 The delicious vanilla-scented upside down plum cake was actually one I made towards the end of the summer, as a treat to enjoy when we were queueing for the proms. 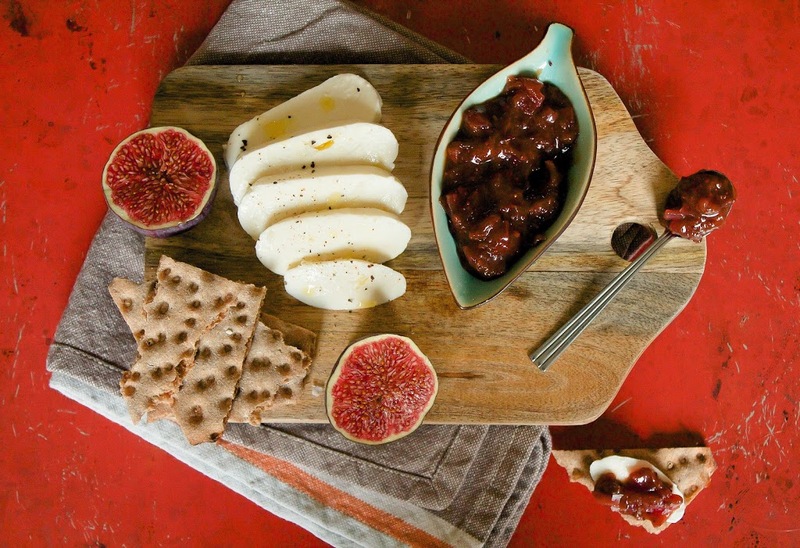 Make sure you caramelise the plums completely to get that gorgeous sticky crunch at the top. 1. 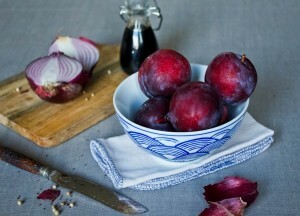 Melt the butter over a low heat and add the plums, onion, garlic and mustard seeds. Cook for a few minutes until the onions are soft and translucent. 2. Add the honey, sugar and chili and stir for a few moments. Add the liquid ingredients and cook over a low heat for about 25-30 minutes. The plums should begin to melt and thicken into a jam-like consistency. 3. Season with salt and pepper before transferring to a sterilised jar and allowing to cool. The chutney will keep for a few weeks in the fridge. 1. Put the oven on to 200 C and line and grease a loose-bottomed 20cm cake tin. Halve the plums and remove their stones. 2. Beat the sugar and butter until light and fluffy. Add the eggs, one at a time, stirring after each addition. Add the milk. 3. Combine the flour and baking powder in a separate bowl and slowly add to the mixture. 4. Melt the 3 tsp of butter and add the plums. Coat with the melted butter before adding the icing sugar. Sizzle until the plums start to caramelise slightly. Arrange in the bottom of the cake tin, cut side facing down. 5. Pour the cake batter into the tin and put in the oven for 30-35 minutes. To check if the cake is ready, prick with a cake tester- it should come out clean and the top of the cake should be slightly golden.